A professional multi-function 8-channel light controller offering 20 built-in programs including various running light patterns as well as many different light effects. The controller also offers an automatic program in which all 20 light effects follow each other repeatedly. The circuit incorporates a speed adjustment control as well as a push button switch that allows reversing the running direction of the current light pattern. It has many applications such as traditional running light effects, Christmas lights, traffic safety arrow light boards, etc. 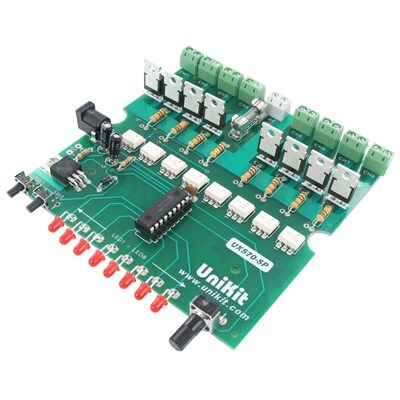 The controller also incorporates 8 opto-couplers for complete isolation of the controller circuit from the AC main for added safety. A case with silk screened panels is available under CanaKit part # BX570. Please note the custom case requires a single hole to be drilled on the side of the case for the adapter jack. A DC version is also available for DC and LED applications under CanaKit part # CK580 / UK580.